Although the requirements for selection of parts according to apparatus group and temperature class for the installation are well known, manufacturers must also consider temperature limits of the component parts and leave enough margin so that internal power dissipation will not take the internal (local) ambient higher than can be accepted for these parts. All new installations should comply with the latest IEC or BS EN standards (or similar specifications, depending on installation location), and everyone associated with the design, selection, installation, inspection and maintenance of electrical equipment for use in explosive atmospheres needs to be fully up-to-speed. IEC 60079-14:2013 contains the specific requirements for the design, selection, erection and initial inspection of electrical installations in, or associated with, explosive atmospheres. Selection of equipment for use in potentially explosive atmospheres is often carried out using IEC 60079-14, or a local standard that is mostly derived from this specification. This requires end users to select equipment according to the temperature class, apparatus group (gas group) and also the ambient temperature range of the site where the installation is to take place. For end users, the requirements are clearly identifiable, but manufacturers often follow a similar process when creating their equipment, using IEC 60079-0, and in this case, there are aspects of component selection that require careful consideration in order to create a compliant assembly. The incorrect specification can lead to time-consuming delays whilst alternative, correctly rated components are sourced, or at worst, a more restrictive Ex code or ambient range on the finished product. Many equipment manufacturers will select certified products to use as component parts for their own equipment, which will then be certified as a complete unit. This equipment is usually built for a specific purpose, simple examples being a rotating machine or a control panel. Certified parts are combined with non-certified parts and then the complete unit is often certified by an appropriate certification body, such as CML. On a rotating machine, the bought in parts are usually fitted externally – bearing vibration sensors, junction boxes to connect auxiliary circuits, perhaps auxiliary motors to drive cooler ventilation fans. These items, fitted externally, may only be affected by heat generated by the machine they are mounted on. With a control panel, certified parts may be fitted partly within and partly outside the enclosure, for example, HMI (human machine interface, PLC (programmable logic controller), other examples are switches and indicator lights. Items such as Intrinsically safe barriers or input/output modules may be fitted internally, along with increased safety transformers, powder filled or encapsulated power supplies, terminals etc. For these enclosed parts, special attention should be paid to the temperature inside the enclosure, since that will be higher than the external ambient the end user will use to select the overall assembly. A control panel, fitted with a number of control modules and other internal parts, will dissipate some heat internally. This will lead to a higher internal air temperature, and in some cases, this increased air temperature may be local to a specific area, if there is significant heat being dissipated and air movement there is restricted. 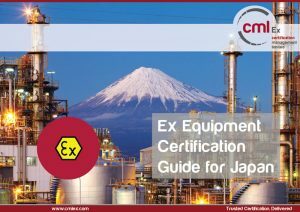 Items certified as ‘equipment’ will be identified in the Ex code because it will have a Temperature Class included, along with an ambient range. If no ambient range is specified, the standard -20°C to +40°C can be assumed. The temperature class is one aspect of the certification, but certification bodies also take into account service temperature, which is relevant particularly for non-metallic materials, although protection methods such as flameproof (IEC 60079-1) which generally use metallic enclosures, also has a limiting temperature range because this affects the way it is tested. Intrinsically safe equipment considers temperature rating of safety components and for this protection method the normal operation of the equipment may not generate significant temperature rise, but fault conditions are also taken into account which can affect temperature assessment of specific components. Component certified parts will normally have a service temperature included on the certificate. Uncertified parts such as connecting wiring will have a continuous operating temperature limit or in a technical data sheet if the item is not certified. When specifying internal parts in the control panel the internal air temperature rise should be estimated from experience or from preliminary tests. If this is not possible, expect a 15K to 20K rise if there are power components fitted. A control panel with very low power dissipation will have a much lower internal air temperature rise. Therefore, a control panel assembly intended for use in a +40°C ambient, may have parts inside that are suitable for perhaps a 60°C ambient. Current-carrying parts will also have their own temperature rise which should be considered against the service temperature or limiting temperature of insulation. Cable entry temperature should also be considered because the cable seal materials are tested for a specific temperature range. If the certificate does not specify a service temperature range or limit, then the minimum range required by the standard is assumed. A plug and socket connector will often have a panel mounting option. The cable entry seal and any non-metallic parts will have been tested for thermal endurance at a minimum of 80°C, and as this thermal endurance is carried out at 20K above service temperature, it can be assumed that a maximum service temperature of 60°C can be applied. A panel mounted plug and socket with this rating may not be sufficient if significant current is passing through it. Certification Management Limited can offer advice on component selection and present training to equip engineers to reduce or eliminate the need to modify the product during certification. Time to market is a key factor in today’s manufacturing environment, therefore accurate specification at an early stage can help the product design process run smoothly and reduce certification time and cost. CML offer an initial free consultation that can be used to obtain advice on requirements and specification. Additional support can also be built into the project cost.